The castle of Old Navarino dates back to the 13th c. when Nicholas II, member of the Flemish family of St. Omer, built a castle for his nephew Nicholas III, who in 1300 held the title of the bailie of Achaea. 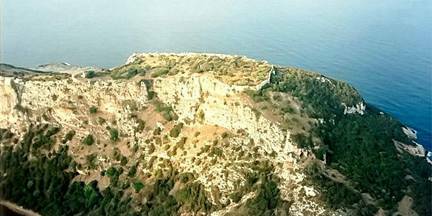 The castle was called the castle of “Avarinos” but the area of the Navarino Bay was also known as Port de Jonc, because of the rushes that grow on its shores (Andrews 2006, 40). In the mid 14th c. Navarino became part of the war stage between the Venetians and the Genoese and it fell into the Genoese, who used it as base from where they launched their attacks against the Venetian colonies (Andrews 2006, 40). Towards the end of the 14th c. Navarino again played an important role in the course of the history of the area, because it became the base for the Navarrese Grand Company (Andrews 2006, 40). The Venetians actually took control of the castle and its surrounding area only in 1423, when they bought it from its prince Centurione Zaccaria (Andrews 2006, 41). Now the Venetian control was expanding even more in the southwestern Peloponnese with the castles and ports of Methone, Corone and Navarino. It is very difficult to assign dates to the architectural remains that stand today in the area of the castle, since it has undergone so many changes and extensions by the Franks, Genoese, Navarrese, Venetians and Turks. Many remains of the Turkish period of control can be seen such as gates, towers, the southern sector of the outer curtain and a cemetery as well as the heightening of parts of the ramparts (Andrews 2006, 48).